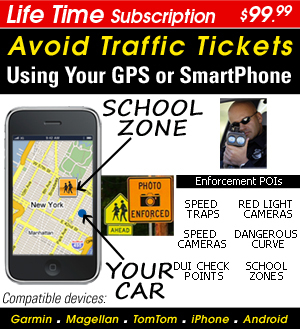 Turn your Smart Phone or GPS into a Speed Trap & Red Light Camera detector-LifeTime Subscription $99.99 - Download over 400,000 + enforcement locations (POI) US/Canada - Discounts Apply ! Hate traffic tickets? Then watch this YouTube video…. “we are not against them… part of the actual enforcement “DUI” is the campaign to tell people to stop driving while intoxicated … and we push out information that says where DUI check points will be and an application that tells you is the same thing we already do.” Virginia Police.